"THURSTON, Abigail (m. White), May 7, 1700." 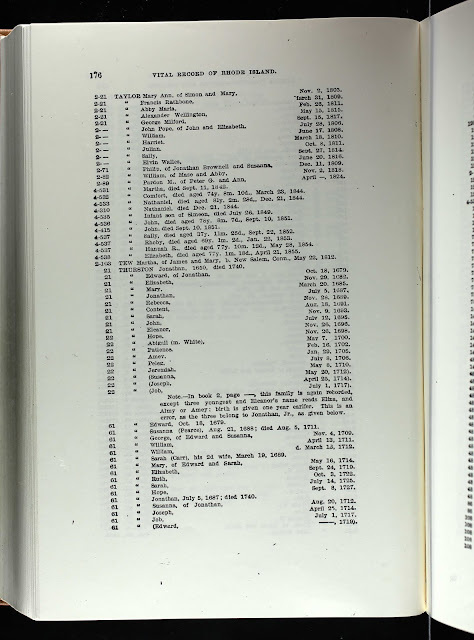 "Rhode Island, Vital Records Extracts, 1636-1899," indexed database and digital image, Ancestry.com (http://www.ancestry.com), Volume 4, "Newport County Births, Marriages, Deaths," Little Compton Births and Deaths, page 174, Abigail Thurston entry. Abigail Thurston (1700-1770) was the daughter of Jonathan and Susannah (--?--) Thurston of Little Compton, Rhode Island. She married William White in 1729 in Little Compton. William White (1708-1780) was the son of William and Elizabeth (Cadman) White of Dartmouth, Massachusetts. They had five children born between 1730 and 1736 in Dartmouth. William and Abigail (Thurston) White are my 6th great-grandparents. I am descended from their son, Jonathan White (1732-1804), who married Abigail Wing (1734-1806) in 1756 and resided in Dartmouth and Westport, Massachusetts. This record for the marriage is a Derivative Source record, because it was copied from town and/or church record books. The Ancestry summary page says that the original data is from Arnold, James Newell. Rhode Island Vital Extracts, 1636–1850. 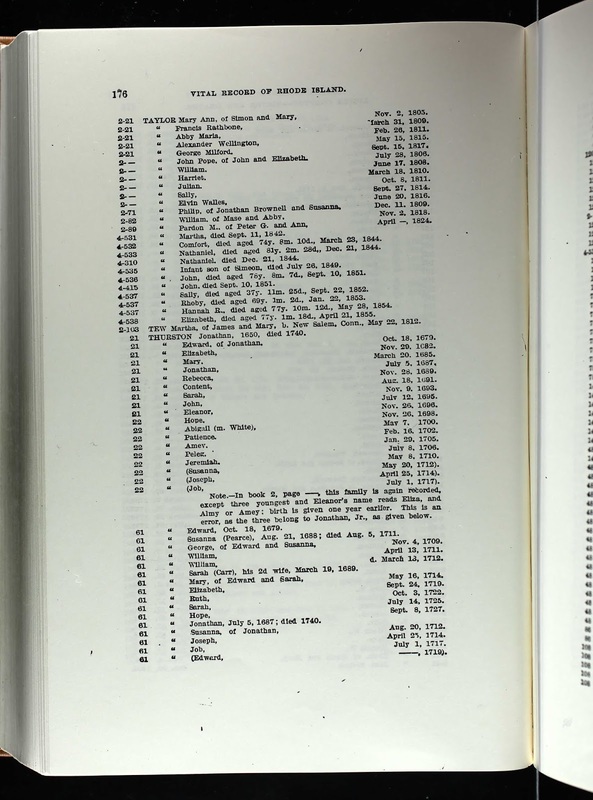 21 volumes. Providence, R.I.: Narragansett Historical Publishing Company, 1891–1912. Digitized images from New England Historic Genealogical Society, Boston, Massachusetts. The original town record is probably in Little Compton, Town and Vital Records, 1697-1907 on FamilySearch digital microfilm. The record image can only be seen at FamilySearch libraries. I've put it on my FSL to-do list.